Reduce fuel expenses and minimize the fleet’s carbon footprint between Chicago’s airports and downtown area while maintaining maximum performance and passenger comfort. 1 million pounds of carbon dioxide eliminated from GO Airport Express’s carbon footprint over the life of their propane autogas fleet. Founded in 1853, GO Airport Express began as a carriage service between train lines. The company has since evolved into a high-tech operation of ground transportation services including airport shuttles, group charters and convention shuttles. GO Airport Express’ mission to provide convenient and affordable transportation solutions has not changed throughout its long history. GO Airport Express is currently the only company with the required certification to provide shared-ride services from Chicago’s O’Hare International and Midway airports. When gasoline prices skyrocketed throughout the nation in 2011, GO Airport Express began exploring alternative fuel options for its 120-vehicle fleet traveling between Chicago’s airports and downtown hotels. Robert Hann, vice president of marketing for GO Airport Express, was concerned that company profits would cycle back into overhead costs to pay for increasing fuel expenses. He needed a solution that would allow the company to remain competitive against local taxi providers. The company was determined to save money while reducing carbon emissions. They compared propane autogas (known as autogas) and compressed natural gas in the categories of range, infrastructure, and costs of vehicle conversion, fuel and maintenance. ROUSH CleanTech worked with Hann and GO Airport Express to make sure that the autogas vehicles would meet and exceed the ground transportation company’s required criteria. After the thorough evaluation, GO Airport Express purchased 30 Ford E-350 vans fueled by autogas. To ensure maximum passenger comfort, the vans were customized with wider rows and additional seating capacity. GO Airport Express’ local propane retailer helped install infrastructure for the propane autogas fueled fleet at the company’s downtown Chicago location. With their fleet constantly on the move, GO Airport Express is looking to set up additional refueling infrastructure options closer to the city’s airports. GO Airport Express’ propane autogas vans began operation in December 2011. They account for half of the company’s total fleet servicing downtown hotels. Since switching to autogas, Hann has been pleased with customer and employee reaction to “greening” their fleet. He even believes the switch has helped the company secure new business. While the importance of a green fleet is not lost on Hann, the primary advantage is the impact to GO Airport Express’ bottom line. With their high-mileage shuttle vans averaging 300,000 miles in their lifetime, the savings add up quickly. For their alternative fuel efforts, GO Airport Express has also received unexpected pay offs. In 2012, the Propane Education & Research Council presented GO Airport Express with its Propane Autogas Fleet Award, recognizing the company for its low-emission, efficient shuttle operations. Hann received a Sustainability All-Star Award from Green Fleet magazine. This annual award distinguishes fleet professionals for outstanding achievements in green fleet sustainability. 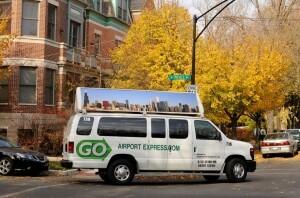 About GO Airport Express: GO Airport Express, one of the oldest companies in Chicago, traces its founding to 1853 and the Parmelee Transportation Company, which provided a carriage service between Chicago’s railroad stations and the downtown hotels. It is a founding member of The GO Group LLC, the nation’s largest airport transportation provider, serving some 60 airports in North America, Mexico, the Caribbean and Europe and transporting more than 13 million passengers per year. About PERC: The Propane Education & Research Council (PERC) was authorized by the U.S. Congress with the passage of Public Law 104-284, the Propane Education and Research Act (PERA), signed into law on October 11, 1996. The mission of PERC is to promote the safe, efficient use of odorized propane gas as a preferred energy source.